Last week I went into The Body Shop and came out with stuff. The best part of this though is that I only paid for three of these products, and even then they were a bit of a bargain. The first purchase was a Thom from Manface enabled purchase. 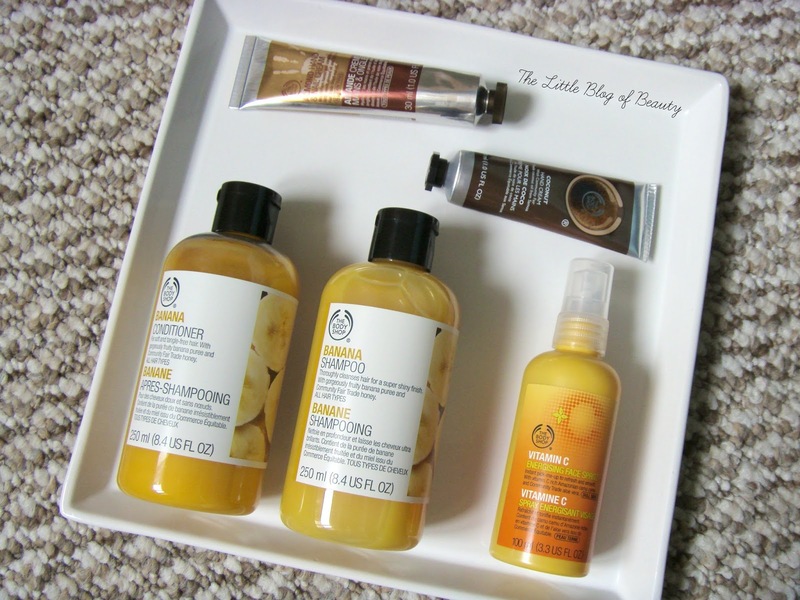 Thom recently wrote a post on The Body Shop's Banana shampoo and conditioner and even though I'm not a huge banana fan (I kind of have to force myself to eat them) I just wanted them. These are usually £4.50 each, which is possibly a little expensive for the size of the bottles, but at the time of purchase The Body Shop were offering 40% off, making them just £2.70 each. The Body Shop can be a little naughty naming products after an ingredient that there's actually very little of in the product, but I'm pleased to report that there is actually a lot of purified banana in these. It's the second ingredient (after water) in the conditioner and the third (after water and SLS) in the shampoo. I love The Body Shop's little mini hand creams because they absorb so quickly so I decided to pick up a new one to pop in my new handbag, which is about four times bigger than my old bag so I can fit so much more in. I think this is my third tube of the coconut one and to be honest I really wanted to try a different one this time, but the ones I was interested in were all out of stock. Under the offer they had at the time I bought this they were offering one of these free if you spent over £10 online, but I did notice that after a few days they swapped it over to a free shower gel instead, so maybe there's a hand cream shortage? My Love your body card ran out at the end of May and although I wasn't sure about it when I first got it (I didn't realise you had to pay £5 for it when I got it) I actually quite like it so decided to renew it. Although you do have to pay a fee to get the card you also get a free gift and this is currently the Vitamin C Energizing face spritz, which is worth £10. The Love your body card only offers 10% off purchases, which isn't as good as the other offers they have weekly, but you can use it on new products, which are excluded from all other offers. It just so happened that I renewed my card in my birthday month so this meant I was entitled to a birthday gift of £5 to spend. As their slightly bigger hand creams are £5 I decided to try out one of these and went for the Almond hand and nail cream. I say slightly bigger but I was surprised to find these actually contain exactly the same amount as the smaller looking £3.50 tubes. I've not tried any of these ones before so I'm looking forward to giving it a try, but I'm not sure I'd pay the extra in future when I'm more than happy with the cheaper ones. All of these products are available in The Body Shop stores and online. Have you bought anything from The Body Shop lately? Those Banana hair products were a bargain! And the Coconut hand cream sounds divine. I love the Body Shop but haven't bought anything from there in ages, that needs to change soon! Ooo, lovely. I haven't been into the body shop for ages, must get myself in there. 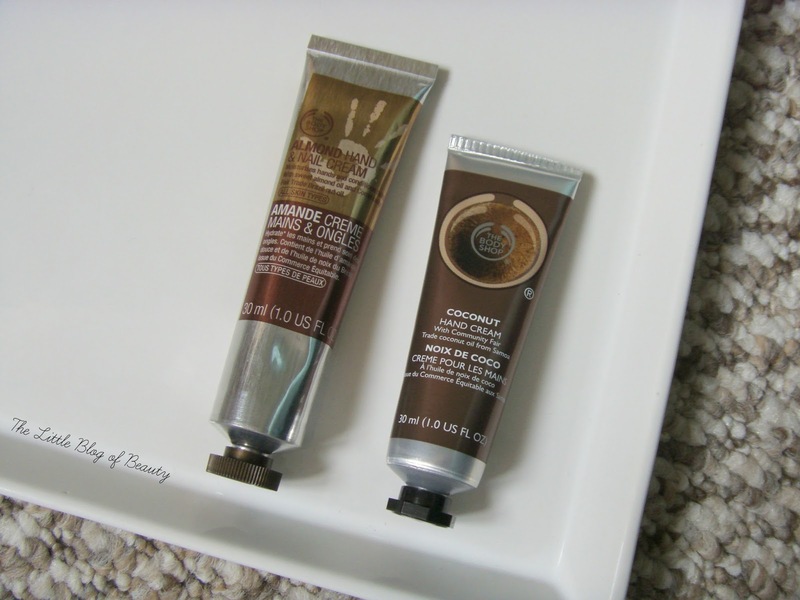 I can't believe those hand creams contain the same amount of product! The larger one looks twice the size! :O I've never smelt the banana range but I'm definitely intrigued by it. Sounds like you nabbed some bargains.